There was no lack of drama last night at Automative High School in North Brooklyn, where residents gathered to speak out against Greenpoint Landing – a series of ten towers that will plop nearly 5,000 new apartments, a public school, and a park on Greenpoint’s quiet shores. The Community Board 1 meeting marked the beginning of the civic vetting rigmarole – known as the Uniform Land Use Review Process – that is required of any large-scale development. Greenpoint Landing is requesting zoning changes for an additional 276 market-rate apartments and 431 affordable housing units; if they get them, they’ll donate $2.5 million to expand the proposed Newton Barge Park by 31,000 square feet. As northern Brooklynites are discovering in various states of anger and disbelief, public feedback can no longer stop the “giant sandwich” from landing on their shores; they can only ask the developers to limit the additional housing and school construction. 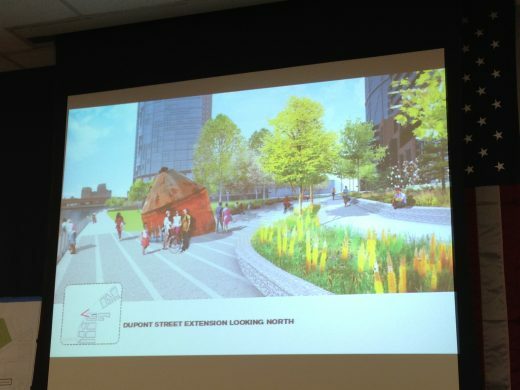 But this harsh reality didn’t stop spirited life-long Greenpointers from shouting over CB1 chairman Christopher Olechowski and Greenpoint Landing representatives to condemn the project whole-hog. Early on, one disgruntled woman single-handedly stopped the meeting with profanities; she eventually walked out in protest, but not before giving the entire audience the double bird. Another Greenpoint lifer, Helen Kersten, responded with disbelief to Greenpoint Landing’s promises that “amenities that will be built on the waterfront area” would be “open to the public free of charge.” “You’re gonna tell me you’re giving us a gift?” she asked. “The only gift here is high-rise apartments. And now you’re telling me I have [waterfront] access? I’ve had access my whole life,” she concluded to clapping audience approval. The developer’s slideshow of a “series of moments” along the waterfront included a rendering of jolly kayakers on the East River. It was met with snickers and murmurs by everyone who knows nearby Newtown Creek is filled with industrial waste and human excrement. The drama was turned down several notches after early squabbles but questions and concerns remained. Many wanted to know the cost of rent for proposed affordable housing – the low-end of which would be available to people with yearly incomes between $19,000 and up to $120,000; or, between 40 and 120 percent of area median income. Corresponding rents would range from $715 to nearly $3,000. There were wide protests that the Area Median Income these figures were based on – a city-wide $63,000 for 2013 – were steep for the local community. “There is a recommendation for lowering the AMI and I think you should take that into consideration,” Chairman Olechowski relayed to Greenpoint Landing reps.
Others requested fully integrated public housing with market rate units and expanded city infrastructure to accommodate population growth and to stop flooding along the waterfront. “10,000 new people are not good for our community, on one of the most toxic waterways in America,” said Darren Lipman, who has lived on Box Street — or, development central — for the past 12 years. Furthermore, he continued, the development rests on a flood zone in an area with among the city’s lowest ratio of parkland to people. He requested that $10 million instead of $2.5 million be donated to park development — or, much closer to what adequate construction would cost. 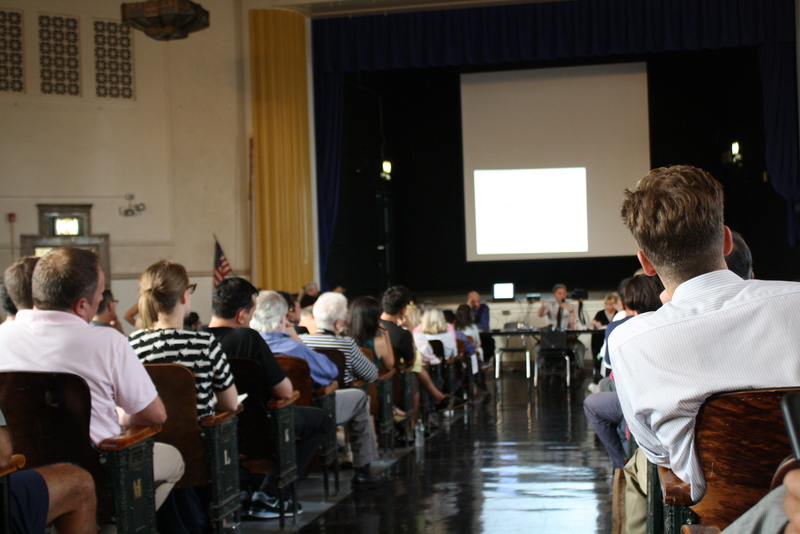 Last night’s meeting also addressed the 640-seat public school that the School Construction Authority would build on land donated by Greenpoint Landing, pending ULURP approval. 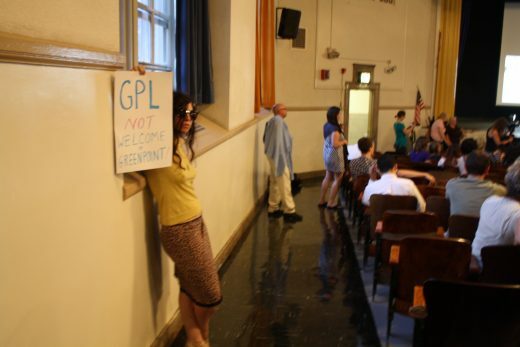 Overwhelmingly, residents expressed fear the school would only accommodate residents of Greenpoint Landing, despite assurances by representatives that it would serve the larger school district. Even though the meeting was one of the only chances for residents to assert any influence on the developer’s plans, many high-tailed it out of the stuffy auditorium before the discussion on the public school even began. A pervasive sense of “what good does it do anyway?” settled over the audience. Whether or not Mazur is right, Community Board 1 will host a second meeting next Tuesday to address requested changes to the Barge and Box Street Parks and a second foregone housing development known as 77 Commercial Street, and the motions, at least, will be gone through once more. The point is not to “protect newcomers from living in their toxic wasteland”. The point is that development is being pushed through faster than a cleanup is. Life long residents didn’t work their butts off on community based planning to improve our environment, so it could be worsened with irresponsible and careless development. Development doesn’t have to happen in one big boom. that’s very sweet and altruistic of the lifers to protect newcomers from living in their toxic wasteland. good going greenpointers!